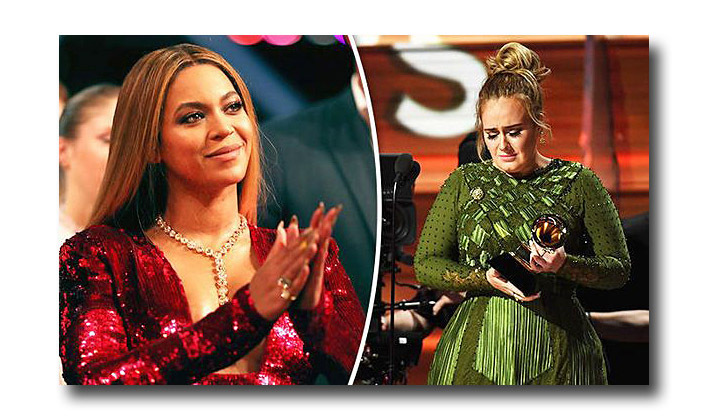 After a long, drawn out battle of the divas it was #TeamAdele's "25" over #TeamBeyonce's "Lemonade" in a 3-0 decision. Adele called for an appeal; ceding Album of the Year to Queen Bey (who BTW looked not only expectant but like she expected to win the biggest awards, resplendent in a red sequin dress and a $12 million, 400 carat Lorraine Schwartz diamond lariat necklace). What a waste since Kanye wasn't even in the house -- along with Bieber, Drake and Ocean who boycotted the "irrelevant" Grammys. 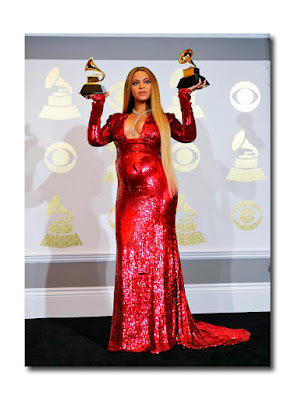 Don't cry for Beyonce -- she's still a winner with two other, if lesser, Grammys. As for Adele, this was actually her second unprecedented move of the night following a bleeped F-bomb in the middle of her off-key musical tribute to George Michael prompting a restart. Plenty of other weirdness transpired (duh, it's the Grammys), some of it even fashion related, so let's go there with some special awards. The "On Sundays We Wear Red with Keyholes Award" is shared by blonde country cuties Faith Hill (in Zuhair Murad) and a more sparkly "Elvis-like" version (Elie Madi) with bell sleeves on Carrie Underwood. Hard to say which one slayed more but Carrie's was def the more typical country music pick. "Best Dressed Daughter of A Music Legend 18 or Over" goes to Paris Jackson in a multi-colored striped Balmain open legged jumpsuit. 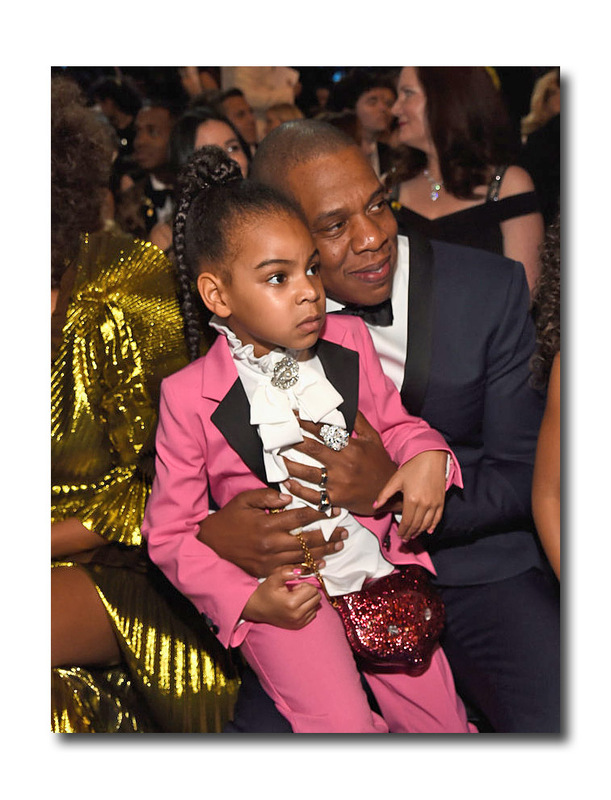 The "BDD of a ML under 18" goes to Blue Ivy in her Prince tribute suit who almost flew onto the stage when her "Vishnu Earth Mother" performed an eye-popping, highly choreographed, mixed reviewed number. There are dual winners -- (one figurative and one literal) for my "Most Balls Award" category. Singer Joy Villa endeared herself to the fly-over states but no doubt diminished her standing (let alone her safety) among those present, in her Trump MAGA dress. Girl Crush, who looked like she fell into the Chuck E. Cheese ball pit, is a close second for obvious reasons. Incidentally, Girl Crush would have totally crushed it if she had walked the red carpet alongside a smiling Lil Yachty -- his rainbow colored grill matched her skirt to perfection. "The Mixed Message Award" goes to Katy Perry in an inharmonious and polarizing champagne colored Tom Ford gown featuring sequins on the top and dirty duster feathers on the bottom -- not unlike her call to unity on the red carpet. 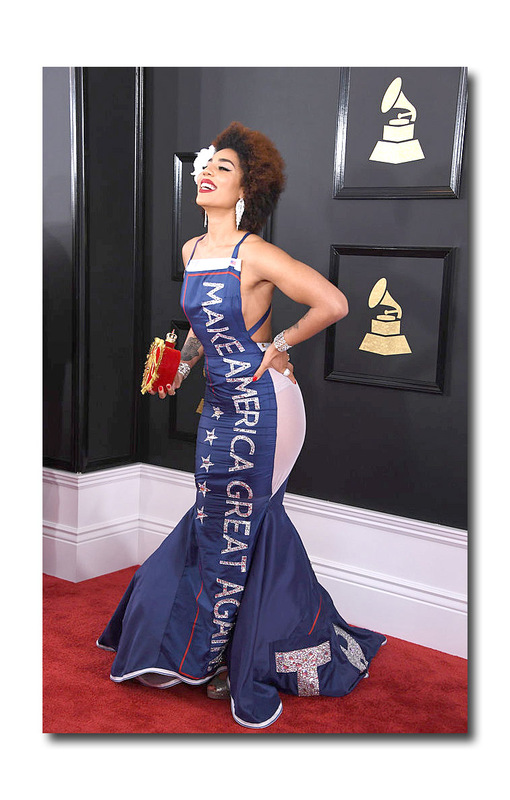 "There's so much divisiveness -- we just need to listen to each other," she told Ryan Seacrest, then performed an angry political anthem wearing a "resist" armband at the awards. 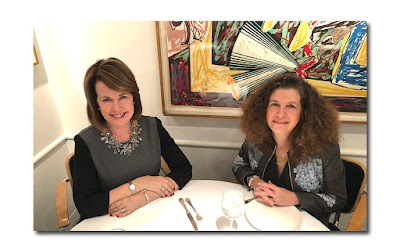 She also dropped the S-bomb during the preshow interview and, if you're wondering about the disheveled platinum hair -- "It's the last color in the Pantone book that I hadn't tried." The "I Want to be Elizabeth Hurley Award" goes to first time Grammys attendee/presenter Laverne Cox in a Bryan Hearns open sided gown which substituted delicate silver chains for the safety pins of the original. Looking for safety pins? Charli XCX represented in a pair of sparkly Vivienne Westwood luxe punk safety pin earrings. I could use a tie breaker for the "IDGAF Award" -- for those who really just can't be bothered. 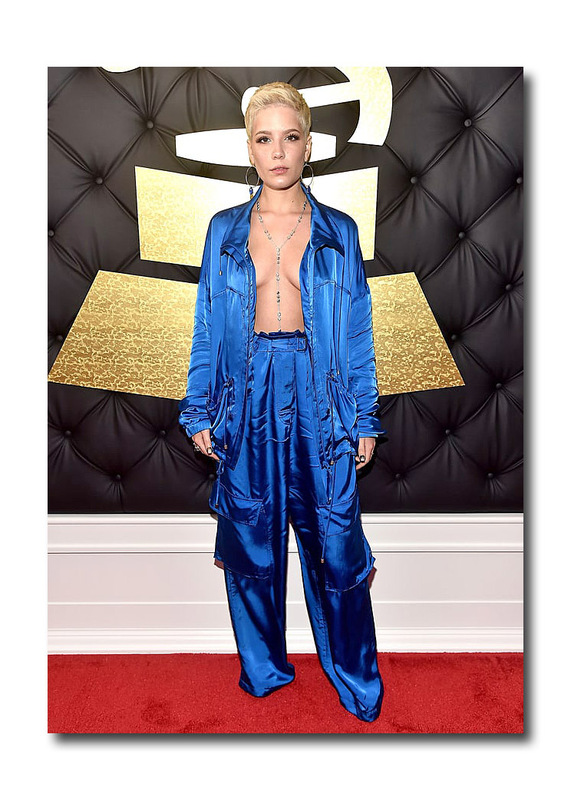 It's a tossup between Halsey in a wrinkled blue satin, baggy and oversized jogging suit -- jacket worn open over skin, or the two men of Twenty One Pilots who dropped trou and ran to the stage to collect their Grammys in their boxer briefs. This was as per a long ago agreement they'd made to do so when they were at home watching the show in their underwear -- thankfully no "tighty-whities" were exposed. Speaking of which, Halsey looked way better in the white crystal embellished outfit she wore when it was her turn to present an award onstage. "Best Group Look Overall" goes to my all-time favorites -- Joe Jonas and DNCE who always look coordinated in a cool pop group way. I also dig the vibe of Pentatonix on the red carpet -- all dressed up in their Grammy best. Shout out to another Jonas Bro -- Nick, you're adorable in your basic black Balmain and studs. "Legs For Days Award" -- this is an easy one -- Heidi Klum in a silver T-shirt looked effortless and, of course, chicer than many of the younger set. "Trend I want to See Die" -- Ugh! Enough with the underboob already. 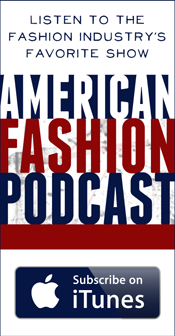 Rihanna mostly exposed her winged tattoo but this ubiquitous look is everywhere these days -- from Paris Hilton on the Christian Cowan runway at NYFW to Gigi Hadid at Tommyland, to Kendall and Kylie in their everyday Lalaland life. Please, we know you can afford slightly more fabric. 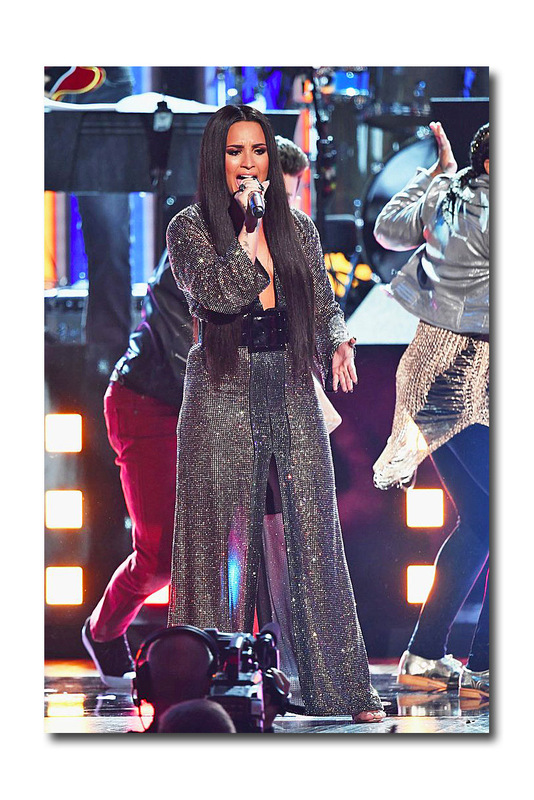 "The Demi-monde Award" goes to Demi Lovato for resembling her namesake Demi Moore more and more with that long straight hair. 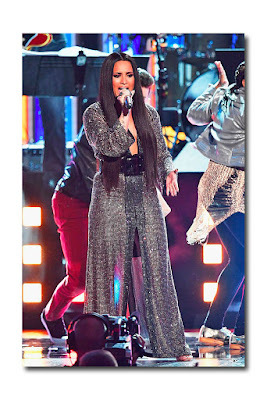 Poor Barry Gibb tho -- her musical tribute to the BeeGees was more embarrassing than anything I can remember wearing during the entire '70s -- and that's saying a lot. Sorry, but most women can't even hit those "Staying Alive" falsetto notes! I know cuz I've tried. Fary’s Company was also responsible for assembling the official Grammy Gift Bag, which the evening’s talent walked away with last night as a “thank you” for their participation in the ceremony. This year’s diverse collection of goodies was valued at approximately $30,000.00. BeBibs: Fashionable adult bibs to protect clothing from accidental mishaps. SweetCheeks Cellulite Massage Mats: Sit on these for 30 minutes each day to reduce the look of cellulite. The Lauren Ashtyn Collection: Luxury European human hair extensions. Bangarang Box: A handmade wooden cube filled with 199 cards of positive actions or quotes. Ponydry: This product allows you to wash the roots of long hair while keeping the rest of your hair dry. Chubby Chipmunk Hand-Dipped Chocolates: “The rarest chocolate in the world” the exquisite Fortunato #4 Nacional chocolate (just rediscovered in Peru and thought to be extinct for 100 years). Gremlin Snackers: Select Topper Pecans and our famous caramel covered in milk chocolate. Betty’s Bites: Pretzel crisps paired with our famous caramel, covered in milk chocolate and sprinkled with sea salt. 6oz Can of Almonds. Flavors: Wasabi & Soy Sauce, Low Sodium, Honey Roasted & Sriracha. A rock & roll thriller by Chris Formant. Customized 64 count box of Crayola My Way crayons containing favorite colors. Personalized box with a name and photo, this one made special just for the GRAMMYs. Crystal Hills Organics has started a hot new trend in beauty with their luxurious body care products that incorporate exquisite flowers, beneficial herbs, and healing crystals. America’s Healthiest and #1 Rated Pizza. A year’s supply of Healing Saint Luminosity Skin Serum. Bonus Gift: Healing Saint Hair Follicle Stimulant which replaces what has been lost due to aging and replenishes the essential growth factors, preventing further hair loss. Hercules Beard Co. brings the power of natural ingredients to men's grooming with hair and skin care that is 100% chemical-free and botanical-based. This premium 5-in-1 formula combines high performance weight loss plus essential vitamins & minerals, active probiotics and antioxidants in a state of the art formula. Mini Gift Set of our Fall/Winter collection. All products are Natural, Vegan and Hemp infused to promote healing and wellness naturally. i-water's origins are from Korea, long known as the land of natural beauty and rich mineral waters. An assortment of 5 books: Garden of Her Heart by Shanna Hatfield, Frenzy by Casey L Bond, Sexiest Man Alive by M Clarke, Crane by Stacey Rourke, and Children Shouldn’t Play with Dead Things by Martins McAtee. Amazing Medice Foot Cream helps make heels smooth and crack free. Mood & Co. Soy Candle with hints of Emerald Sea, Sandal Wood and Hugo. Pole Star Pin is crafted with precision to make a fine jewelry collectible, inspired by the stars. New Hydro Wash body wash and Odor Blocker anti-perspirant/deodorant in Steel Courage scent. A pair of handmade studs made with quality materials such as sterling silver and crystal. PHIZZ is a Swiss made effervescent tablet. Combining a rehydration formula with a mix of essential vitamins and minerals, PHIZZ helps you travel fresh and play hard. Reloved Vintage Paint Creative Soul Project Kit. Rest-Rite Sleep Positioner literally saves relationships! Instead of pushing your partner over all night because of snoring, you can just pick one up from your bedside table and pop it on his back or shirt with its medical grade adhesive … within seconds you have solved the problem. Now when your partner tries to roll onto his back, this positioner will give a gentle nudge to go back to his side without even waking him up! New Revox 7 peptide-rich serum softens the appearance of 7 types of facial expression lines. The book that brings out your inner smile. GRAMMY talent to receive the Woosh Beauty Expert Eye Kit, Flex and Curl Mascara with Lash Shield, and Spin-On Lip Gloss Duo. All the photos are amazing the designs are also good thank you for sharing this post.